Ida, Now a Tropical Depression, Could Become a Tropical Storm Soon. But will it strengthen further to a hurricane-force storm as it enters the warmer waters in the Gulf of Mexico? FEWW Moderators believe, as of posting, that Ida has a more than 1 in 4 chance [P≥0.25] of redeveloping into a hurricane-force storm after entering the Gulf of Mexico. GOES Sat Image- Still frame. Click image to enlarge and update. IDA is expected to reach the Yucatan Channel late Sunday EST. 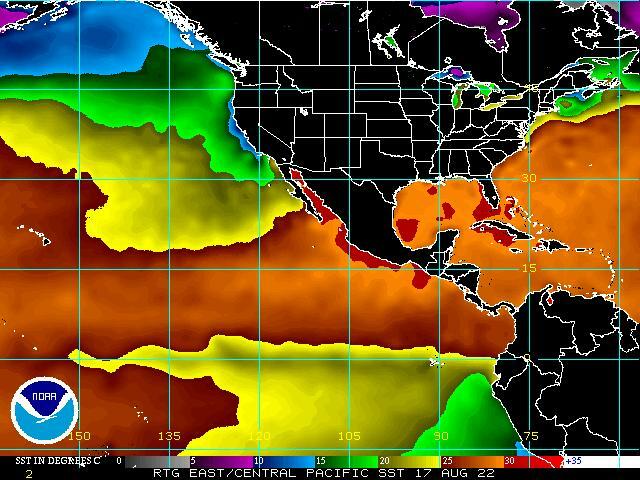 POES Composite – Daily Sea Surface Temps. Wondering what happened to the Atlantic Hurricane Season? As [tiny] Fred begins to fizzles out of its hurricane status in the Atlantic ocean about 1,190 km (740 miles) west of Cape Verde Islands, mot everyone must be thinking whatever happened to the 2009 Atlantic hurricane season. Hurricane Fred. GOES Floater Imagery – Still Image – See inset for date and time. Summary of Hurricane Fred Status: Fred is weakening further as it slows down more. (3 mph) with a min pressure of 735.1 mmHg (80 mb), NHC/NOAA said, expecting it to downgrade to a tropical storm within the next 24 hrs. For one thing, it’s not over yet, at least not until the “fat lady” strikes. The peak months are August to October. For another, the strengthening El Niño episode seems to be disrupting storm formation in the Main Hurricane Development Region, the Atlantic basin, AND forcing the storms away from land. In fact, NOAA’s updated 2009 Atlantic Hurricane Season Outlook predicts a 90% chance of a near-normal or below normal hurricane season. NOAA recounts two competing climate factors. “Hurricane Jimena plowed over Baja California on Wednesday (PDT), tearing off roofs, knocking down power poles and bringing welcome rainfall to a drought-stricken state. ” AP reported. Jimena is expected to produce total rain accumulations of 12 to 25 cm ( 5 to 10) inches over the southern half of the Baja Peninsula and portions of western Mexico during the next couple of days, with possible isolated maximum amounts of about 40cm (15 inches). These rains could produce life-threatening flash floods and mud slides. A dangerous storm surge along with large and dangerous battering waves will produce significant coastal flooding along the Baja California Peninsula. Jimena is moving in the north-northwesterly at about 20 km/h (13 mph), and is expected to continue in that direction, at a slower forward speed in the next 24 to 36 hours. Hurricane Jimena weakens to a Category 3B on FEWW Hurricane Scale (Cat 3 on Saffir Simpson scale) with maximum sustained winds of about 201 km/h (125 mph), still a major hurricane. Conditions are expected to deteriorate over the southern portion of the warning area later today and preparations to protect life and property should be rushed to completion. For storm information specific to your area, monitor your national meteorological service. Palm trees are blown by strong winds in Cabo San Lucas in Mexico’s state of Baja California, as Hurricane Jimena approaches, September 1, 2009. Hurricane Jimena, an extremely dangerous Category 4 storm, barreled toward Mexico’s Baja California peninsula on Tuesday, forcing tourists to flee the Los Cabos resort area. REUTERS/Henry Romero (MEXICO DISASTER ENVIRONMENT IMAGES OF THE DAY). Jimena is still moving on forecast track in NNW direction at a leisurely speed of about 19 km/h (12 mph), and is expected to continue same next couple of days. Making landfall probably as a Category 4 to 5 Hurricane, Jemina could cause extensive coastal flooding along the Baja California coastline. Hurricane Jimena -Rainbow enhancement – Still Image. Click image to enlarge and update. Jimena is not very large in size. Hurricane force winds extend outward up to 75 km (45 miles) from the center, and tropical storm force up to 220 km (140 miles). At its current forward speed, Jimena should be approaching the southern tip of the Baja California Peninsula by tonight local time (PDT). Fed by the warm coastal waters, Jimena may remain a major hurricane until landfall. Hurricane Jimena- Still Frame – see image for date. To enlarge and update, click on the image. POES Composite – (Daily Sea Surface Temperatures) – Still Image. To enlarge and update, click on th eimage. Still Image. Click on the image to enlarge and update. At 09:00 UTC the center of Bill was located near 48.6°N 50.2°W or about 305 km northeast of Cape Race Newfoundland. It was moving ENE at 69 km/h, and could continue in that direction at a faster forward speed for the next couple of days. Maximum sustained winds are 110 km/h, but gradual weakening is forecast. Bill is no longer a tropical cyclone, however it may produce a large area of storm and gale force winds over the north Atlantic during the next day or two. Tropical storm force winds extend outward to about 510 km from the center. Bill is about 375 km west of Cape Race, Newfoundland, moving toward the northeast near at 56 km/h, HNC said. The hurricane is expected to increase its forward speed tonight and Monday, and will pass on the forecast track near or over southeastern Newfoundland later tonight (local time). Bill is a category one hurricane with maximum sustained winds of about120 km/h, but is expected to become extratropical by Monday, HNC reported. Hurricane force winds extend outward up to 95 km from the center, with tropical storm force winds extending to about 465 km. Meanwhile, NHC reported increased showers and thunderstorms in association with a tropical front about 960 km east of the Leeward islands, with the less than 30 percent probability of the system becoming a tropical cyclone in the next two days. The east coast of Nova Scotia from Ecum Secum to point Aconi. The coast of Massachusetts from Woods Hole to Sagamore beach, including the islands of Martha’s Vineyard and Nantucket. Southern…and eastern coasts of Newfoundland to Harbour Deep. The center of hurricane bill was about 415 km SSE of Nantucket Massachusetts and 880 km SSW of Halifax Nova Scotia. Hurricane force winds extend 140 km from the center, tropical storm force winds extend 445 km. Total rain accumulations of 7 to 12 cm with isolated maximum of 17cm are expected near the track of Bill across Nova Scotia, Prince Edward Island and Newfoundland. 2 to 5 cm of rain are expected over Nantucket island…with around 2.5cm over outer Cape Cod and Martha’s Vineyard. Large swells generated by Hurricane Bill will continue to affect much of the U.S. east coast and spread into the Atlantic Maritimes of Canada tonight and Sunday. These swells will likely cause extremely dangerous surf and life-threatening rip currents. Swells From Bill are still affecting the Bahamas and Bermuda but should gradually diminish tonight. For images of Hurricane Bill, forecast path and wind charts scroll down the page. Tropical storm warning for the coast of Massachusetts from Woods Hole to Sagamore Beach including the islands of Martha’s Vineyard and Nantucket. The center of Hurricane Bill was located near 33.0°N, 68.5°W or about 355 km WNW of Bermuda and about 690 km ESE of Cape Hatteras, NC. Also about 925 km south of Nantucket, Massachusetts. The core of Hurricane Bill is expected to pass over the open waters between Bermuda and the east coast of the United States this morning. Bill is expected to pass offshore of the coast of New England late today or tonight and approach Nova Scotia on Sunday. Bill is a category 2A hurricane on the FEWW New Hurricane Scale (category two the Saffir-Simpson scale) with maximum sustained winds of about 165 km/h (with higher gusts). Some strengthening is possible today followed by weakening tonight and Sunday as the center of bill moves north of the Gulf Stream. Hurricane force winds extend outward 140 km from the center, and tropical storm force winds by up to 445 km. The Bermuda weather service has indicated that the storm tide will raise water levels by as much as a 0.9m (3 feet) above ground level along the coast, causing large and dangerous battering waves. Large swells generated by Hurricane Bill are affecting the Bahamas, and Bermuda, also beginning to affect the southeast coast of the United States. Large swells will begin to affect much of the remainder of the U.S. east coast and the Atlantic Maritimes ofCanada later today and Sunday. These swells will likely cause extremely dangerous surf and life-threatening rip currents. For images and charts see below. The center of hurricane Bill was near 31.0° N, 67.5° W, about 295 km (180 miles) WSW of Bermuda, and 880 km (545 miles) ESE Cape Hatteras, NC. Bill is a category 2A on FEWW New Hurricane Scale (category two on the Saffir-Simpson scale), with some strengthening possible within the next 24 hours, HNC reported. Still Frame. Click on the image to enlarge and update. And so pleased with their work, they moved the image acquisition date forward by 30 days to September 30, 2009! As for the chemical treatment [ ‘re-engineering’] hint, notice the thin, curvy line which emerges at 8 o’clock and rejoins Bill’s ‘mane’ at 10 o’clock [there are also two shorter similar lines starting at about 6 o’clock just south of the eye] appear to be an abnormal aberration. Could it be that Bill is chemically sprayed in an attempt to ‘control’ and ‘re-engineer’ it—to slow it down and make it disintegrate? Hurricane Bill is grown larger in size since the last report, and has regained some of its lost strength. Its hurricane force winds now extend out to about 185 km (115 miles) from the center, with tropical storm winds stretching as far as 415 km (260 miles), according to HNC. Bill is expected to regain cat 4 strength by Friday, HNC said. Bill is a category 3C on FEWW New Hurricane Scale (category 3 on Saffir-Simpson scale), with its eye located about 885km (550 miles) south of Bermuda, and about 1,640 km (1,020 miles) southeast of Cape Hatteras North Carolina. Hurricane Bill – GOES East – Unenhanced – Still frame (cropped) – Aug 21, 2009, 01:15 UTC. Click on the Image to enlarge and update. FEWW Comments: Bill is now a giant tropical cyclone with its hurricane force winds extending to about 165 km (105 miles), and tropical storm winds extending to 415 km (260 miles).The sheer size of the cyclone has understandably slowed it down one step to a category 3 hurricane on the Saffir-Simpson scale. It’s entirely probable, however, as Bill approaches warmer coastal waters, it would regain its wind speeds, strengthening to at least a category 4, possibly a cat 5 hurricane. A work of contemporary art. Hurricane Bill at Cat 3. GOES – Still Frame – Funktop Enhancement – Aug 20, 2009, 14:45 UTC. Click on the Image to enlarge and update. Bill is currently about 610 km (380 miles) north of the Leeward Islands, and about 1,120 km (695 miles) SSW of Bermuda, NHC said, expecting to continue on their forcast track through Friday. “The core of hurricane Bill is expected to pass over open waters between Bermuda and the east coast of the United States early Saturday,” NHC reported. Bill’s hurricane force winds extend out 140 km (85 miles), about twice as far as they did when Bill became a major hurricane, and tropical storm winds to 370km (230 miles). Given its strong symmetry, early organizing ability, rapid rate of development as well as the favorable oceanic and atmospheric conditions, Bill has the potential to grow to be one of the largest and most powerful hurricanes ever recorded. Hurricane Bill – Cat 4 – GOES Imagery – Atlantic Views – Visible – Still Frame – Date: Aug 20 2009 at 04:15 UTC. Click on the Image to enlarge and update. Hurricane Bill – Cat 4 – GOES Imagery – Shortwave – Still Frame – Date: Aug 20 2009 at 04:15 UTC. Click on the Image to enlarge and update. BILL IS ABOUT 315 MILES (505 KM) NORTHEAST OF THE LEEWARD ISLANDS AND ABOUT 880 MILES (1,415 KM) SOUTH-SOUTHEAST OF BERMUDA. Hurricane Bill strengthened to a Cat 4 on Saffir-Simpson scale. Click image to enlarge and update. See also FEWW New Hurricane Scale. Hurricane Bill is expected to strengthen further, NHC said. Adding that, bill will create large swells which would impact the islands of the northeast Caribbean sea in the next 48 hours. Bermuda and parts of the SE coast of the US would be affected similarly, Friday and Saturday. For background information, details of Bill’s progress and additional images, see Atlantic Hurricanes 2009. FEWW Comments: There’s a small probability of about 0.15 that Bill could move in a westerly direction toward the Gulf of Mexico, making his first landfall on the coast of Alabama. Bill is grown into a large hurricane: Its hurricane force winds extend to 75km (45miles), and its tropical storm force winds to about 280km (175 miles). Bill is about 895km east of the Leeward Island as of the above time. “Large swells associated with bill will be impacting the islands of the northeast Caribbean sea during the next day or two.” NHC reported. GOES East Full Disk. Updated every three (3) hours. Click on th eimage to enlarge. TS Bill became the first hurricane of the 2009 Atlantic hurricane season today, about 1,160 miles east of the Lesser Antilles islands of the Caribbean, the national hurricane center reported. Bill has sustained 120 kilometers per hour winds, as it races west across the Atlantic Ocean. Bill’s strong, “twin-Engine” symmetry may help it strengthen to a major hurricane as it races west across the Atlantic. MAXIMUM SUSTAINED WINDS HAVE INCREASED TO NEAR 100 MPH (160 KM/HR) WITH HIGHER GUSTS. ADDITIONAL STRENGTHENING IS FORECAST in THE NEXT 48 HOURS, AND BILL COULD BECOME A MAJOR HURRICANE WITHIN THE NEXT DAY OR SO. THE CENTER… AND TROPICAL STORM FORCE WINDS EXTEND OUTWARD UP TO 150 MILES (240 KM). After a slow start to the six-month Atlantic hurricane season, CLAUDETTE, the third Atlantic tropical storm of the year formed just over a day after TS Ana and Bill, on Sunday. TS CLAUDETTE, according to the US National Hurricane Center Intermediate Advisory 4A, as of 8:00 PM EDT was located at 29.7N 85.9W with Max. sustained winds of 80km/h (50 MPH) moving northwest (310 degrees) at a cruising speed of about 19km/h (12 MPH) with a minimum central pressure of 1008MB. TS force winds radiate outward up to about 110km from the center. Claudette is expected to dump up to 15cm of rain across Florida Panhandle, the big Bend region of Florida, Central and S. Alabama, and extreme SW Georgia, the NHC advisory said, with the storm tide rising to a maximum of 150cm. Bill is the guy to watch for. Some forecasts expect Bill to grow into a Category 3 hurricane [cat 3 and stronger hurricanes are designated as a major categories,] with winds of more than 180 km/h in the next 3 to 4 days. The Gulf of Mexico oil and gas operations are unaffected for now, however, they could be pummeled later in the season. Meanwhile, hurricane Guillermo is about to cross into central Pacific. Claudette satellite image – rainbow enhancement curve – still frame as dated. To enlarge and update click on the image. To enlarge and update click on the image. REPORTED A WIND GUST TO 45 MPH…72 KM/HR. ALL FLOOD RELATED WATCHES AND WARNINGS HAVE EXPIRED WITH THIS SYSTEM. The red shaded area covering about a half of Florida panhandle is small area of low pressure in the Gulf of Mexico centered about 130km SW of Tampa, which according to the NWS TPC/National Hurricane Center is becoming better organized with the possibility of developing a “closed surface circulation” with a more than 50 percent probability of developing into a Tropical Cyclone later today. Area of low pressure, Gulf of Mexico, IR image. Click on the image to enlarge and update. COAST OF FLORIDA SHOULD CLOSELY MONITOR THE PROGRESS OF THIS SYSTEM.” NHC said. TS ANA: Click on the image to enlarge and update. Coastal Watches/Warnings and 5-Day Track Forecast Cone. Click on the image to enlarge and update. Tropical Storm Force Wind Speed Probabilities – 120 Hours. Click on the image to enlarge and update. TS BILL: Click on the image to enlarge and update. FEWW Forecast: Florida, the north and NE Gulf areas may be in for an extremely wet season in 2009. A TROPICAL STORM WATCH REMAINS IN EFFECT FOR PUERTO RICO…THE U.S.
70 MILES…115 KM…SOUTH OF ST. CROIX. REACH THE DOMINICAN REPUBLIC LATER TODAY. ESTIMATED MINIMUM CENTRAL PRESSURE IS 1008 MB…29.77 INCHES. …1870 KM…EAST OF THE LESSER ANTILLES. MAXIMUM SUSTAINED WINDS HAVE INCREASED TO NEAR 75 MPH…120 KM/HR. ESTIMATED MINIMUM CENTRAL PRESSURE IS 987 MB…29.15 INCHES. AND ABOUT 85 MILES…135 KM…SOUTHWEST OF MONTGOMERY ALABAMA. THE ESTIMATED MINIMUM CENTRAL PRESSURE IS 1011 MB…29.85 INCHES. THE BIG BEND REGION OF FLORIDA…AND SOUTHERN TO CENTRAL ALABAMA. AT 5 PM AST (2100 UTC) ALL TROPICAL STORM WATCHES HAVE BEEN DISCONTINUED.